In his typical lack of decorum and presidential etiqquett, president Michael Sata has again verbally abused opposition UPND president Hakainde Hichilema by labelling his letter of advice over traditional and chiefs affairs. Last week, Mr. Hichilema catelogued a number of instances over Mr. Sata’s handling …of chiefs and traditional affairs matters in the country. But is his typical Kaponya and thuggery style, Mr. Sata has replied and leaked this letter to the Watchdog below to the Zambian watchdog telling Mr. Hichilema to appoint Henry Kanyanta Sosala as his Chitimukulu if he so wishes. 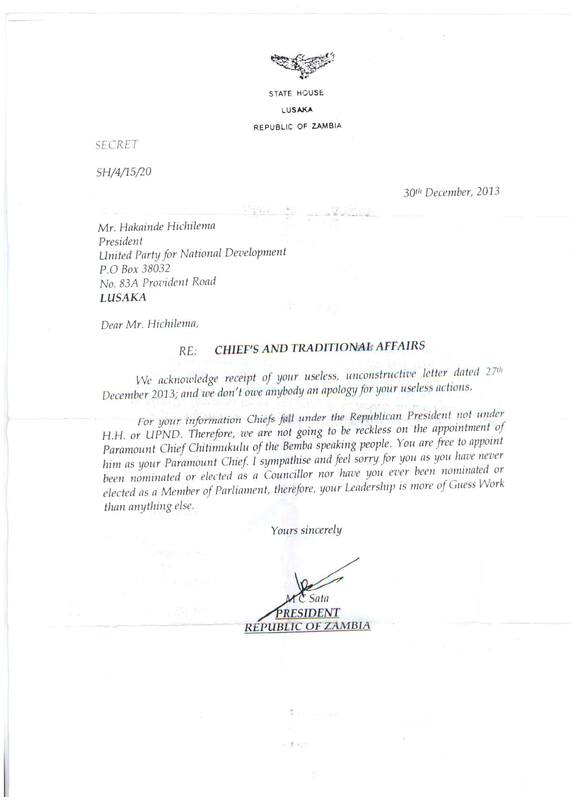 Here is Mr. Hichilema’s letter and below the reply Mr. Sata leaked to the media. The above captioned subject matter refers. We again write regarding your administration’s misguided decision to ridicule chiefs and interfere in the internal traditional process of chiefdoms. There is a growing national chorus of voices expressing deep disappointment and even outrage at what this strange behavior communicates. • You degazetted Chief Mwamba of the Bemba people. More recently, after Chief Mwamba was chosen by the Bashilubemba to become the Chitimukulu, you stopped his ascension to the Chitimukulu throne by deploying Policemen at the Palace. In short, your administration has embraced a policy that is bringing the presidency into public odium and disrepute. The presidency is an institution representing more than 13 million Zambians and is not just for Patriotic Front. Our advice is that your administration should not interfere in traditional matters but let traditional structures deal with traditional matters. In the case of the Chitimukulu, we advise that let the will of Bashilubemba prevail without hindrance.